Kevin James is one of America’ s most beloved comedic performers, and he will be making a super rare comedy club appearance. Don’t miss this rare opportunity to see one of comedy’s best in an intimate comedy club setting! Kevin James began his career as a stand-up on the Long Island comedy scene. After being discovered at the 1996 Montreal Comedy Festival, he signed a network development deal to create his own sitcom. The King of Queens, which premiered in 1998, ran for nine seasons on CBS with James starring and executive producing, and it garnered him an Emmy nomination in 2006 for Outstanding Lead Actor in a Comedy Series. The show concluded its run in 2007 but continues to air daily in syndication across the country and around the world. James also starred in and executive produced the sitcom Kevin Can Wait for Sony Television and CBS. In 2001, James brought his stand-up act to TV with Sweat the Small Stuff, a one-hour special for Comedy Central. In 2005, Kevin James and Ray Romano executive produced and starred in the HBO Sports Special Making the Cut: The Road to Pebble Beach; a documentary about the Pebble Beach Pro Am Golf Tournament that was nominated for a Sports Emmy. 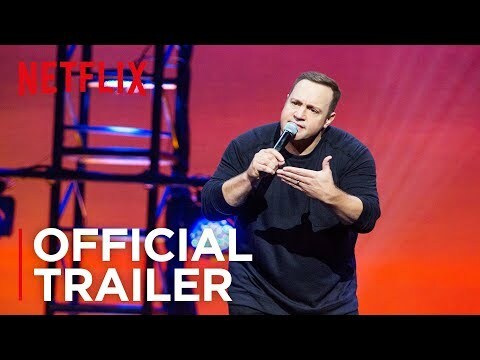 His second comedy special Never Don’t Give Up premiered on Netflix in April 2018. James was the producer, co-writer, and star of the hit comedies Paul Blart: Mall Cop 1 & 2, Zookeeper, and Here Comes The Boom. James made his feature film debut in 2005 in Columbia Pictures’ Hitch starring opposite Will Smith, and starred alongside Adam Sandler in Pixels, Grown Ups, Grown Ups 2, and I Now Pronounce You Chuck and Larry. He starred in the feature True Memoirs of an International Assassin for Netflix in 2016. In addition to his on-camera work, James’s voice has been featured in the animated films Barnyard for Nick Movies, as well as Monster House and the Hotel Transylvania franchise for Sony Pictures Animation.